»Rummelige og ungdommelig lejlighed i et populært kvarter i byen. To soveværelser med dobbeltsenge, stue med dobbelt sovesofa behageligt for to personer, spisestue, fuldt udstyret køkken og et badeværelse. Vi har aircondition og varme. Godt placeret og med en bred vifte af offentlig transport i nærheden, der ruller gennem byen, rundt og fra lufthavnen. Der er betalende parkering i nærheden af ​​bygningen. Barneseng til rådighed på anmodning. 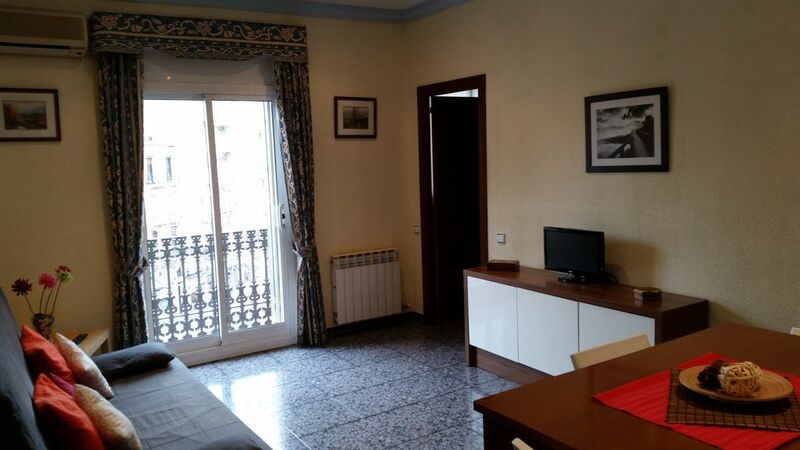 This is a clean, comfortable, convenient flat in a central, pleasant part of Barcelona. The neighbours are quiet and friendly. There are many useful shops and restaurants close to the flat. The flat is close to La Sagrada Familía and has excellent links to buses, metro and trains connecting quickly with other parts of the city. As advertised there is no WiFi but there is good mobile coverage. Encantadora familia, cuidadosa con el apartamento. Deseamos que hayan pasado una agradable estancia en nuestro apartamento. Esperamos recibirles en una próxima ocasión, gracias por elegirnos. Pedro was very helpful when we arrived. He showed us all the details of the apartment as well as how to get around. The apartment was stocked with all the equipment we needed to cook and live. There was four of us living here and we were all very comfortable. The water heater is pretty small. We could get one warm shower in before it became luke warm. The pressure wasn’t great either. Really the only problem I had with this place. It is right by the L2 metro. You are 10 minute subway ride from great locations! You’ll probably have to transfer to get to the major locations. Spain’s metro is fast though, so it’s not a burden. The neighborhood itself is residential and quite. There are supermarkets and restraunts right out the door. It’s not be able to come back to some where quite. it’s on the fourth floor and a bit walk. THERE’S NO WIFI. The description says this, but I missed it when I booked. The walls are thin. We didn’t hear the neighbors. They heard us when our volume went a little bit above a conversational volume. I’d imagine this place would work perfectly for a family that wants to explore Barcelona. We are glad that you enjoyed your stay in our apartment, although you will not take much care of it. But I think you confuse concepts, to start with is not a heater but a mixed boiler with enough power to heat a house, but you have to use the equipment properly to get the maximum performance. You also have to read carefully, because in the announcement it is very clear that the apartment does not have Wi-Fi. You also have to listen carefully, when you are told not to make noise that bothers neighbors and not leave trash in the apartment and deposit it in containers on the street. I hope that these constructive explanations clarify a bit the sense of responsibility and serve as an experience in future trips. Wonderful place and Pedro and Maria were the best!! Overall we liked our stay at Pedro and Maria's place in Barcelona. The metro is around the corner with many grocery stores in the same block. Everything worked really well in the apartment and we liked having enough space inside to move around unlike a hotel room. Pedro and Maria were very nice and they explained the area in and around the city. The place was spotless when we arrived. Gracias por todo. Hemos desfrutado mucho! Vielen Dank für die Gastfreundschaft. Wir habenunvergesliche Tage In Barcelona verbracht. Uns fehlte nur Internet und Aufzug. Herzlichen Dank für die ausführliche Informationen über Barcelona. Pedro et sa femme ont été adorables. Ils nous accueillis avec beaucoup de gentillesse alors que nous sommes arrivés à 23h45 (4h de retard de vol !). Ils ont pris le temps de nous faire visiter l'appartement (plus quelques explications) et de nous donner des informations sur le quartier et les moyens de transports pour les sites touristiques. L'appartement est en bon état, conforme aux photos. Seule la paroie de douche mériterait d'etre changé. Attention, 4e etage sans ascenseur et il y a des travaux qui vont durer très longtemps en bas de l'immeuble. L'avantage des travaux c'est la fermeture à la circulation, du coup les nuits sont très calmes. L'inconvénient c'est que vous ne dormirez pas au delà de 8h du matin, à moins d'avoir des bouchons d'oreilles. Familiale et conviviale et agréable, je l'espère vous voir à Barcelone en une autre occasion. Cordialement. Nærheden til togstationen giver mulighed for at gå roligste og reneste strande i byen Barceloneta, nord Badalona, ​​Montgat, Ocata; syd Castelldefels, Sitges fundet for 10-30 minutter Clot station, eller et kort besøg til "Costa Brava" eller "Gold Coast". Se solicita una cuota de reserva que se envía por transferencia bancaria, la cantidad restante se paga en efectivo a la llegada al apartamento. No se admiten ningún tipo de cheque bancario o cheque vacaciones. Tarifa en función del número de personas, arras/deposito de reserva, entrega de llaves realizada por propietario ausente durante la estancia. Se aplicará un suplemento por limpieza.